Installation of OpenStack using packstack is very simple. After a test installation in a virtual machine, you will find that the basic operations for creating and using virtual machines is now quite simple using a web interface. It is important to understand the virtual environment. While everything is running on a desktop, the setup consists of multiple logical networks interconnected via virtual routers and switches. You need to make sure that the routes are defined properly because otherwise you will not be able to access the virtual machines you create. 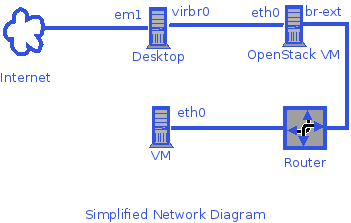 On the desktop, the virt-manager creates a NAT based network by default. NAT assures that if your desktop can access the internet, so can the virtual machine. The internet access had been used when the OpenStack distribution was installed in the virtual machine. Now, browse http://192.168.122.54/dashboard and create a new project and a user associated with the project. Sign out and sign in as youser to create and test a cloud VM. Create a Router and set gateway to the public network. Add an interface to the Private network and ip address 192.168.10.254. To be able to sign in using ssh, under the Project/Compute/Access & Security, in the Security Groups tab, add the following rules to the default security group. Allow icmp access: Custom ICMP Rule with Type and Code value -1. Select Import Key Pair option and give it a name, e.g. desktop user login. Give it a name – test and choose the m1-tiny flavor. Select boot source as 'Boot from image' with image name 'cirros', a very small image included in the installation. Once it is launched, associate the floating ip obtained above with this instance. you should be signed into the virtual machine without needing a password. You can experiment with importing the Fedora VM image you used for the OpenStack VM and launching it in the cloud. Whether you succeed will depend on the resources available in the OpenStack VM. The answers to the other questions will depend on the network interface and the IP address of your desktop but there is no ambiguity in it. You should answer with the interface 'lo' for CONFIG_NOVA_COMPUTE_PRIVIF and CONFIG_NOVA_NETWORK_PRIVIF. You don't need an extra physical interface as the compute services are running on the same server. Now, you are ready to test your openstack installation on the desktop. You may want to create a project and add a user to the project. Under Project/Compute/Access & Security, you will need to add firewall rules and key pairs as above. However, you will not need to create any additional private network or a router. Import a basic cloud image, e.g. from http://fedoraproject.org/get-fedora#clouds, under Project/Compute/Images. You may want to create an additional flavor for a virtual machine between the m1.tiny and the m1.small, say, m1.mini with 1GB RAM and 10GB disk. This will need to be done as the admin user. Now, you can create an instance of the basic cloud image. The default user is fedora and your setup is ready for exploration of hadoop data.